Need a chain? We can make it. We understand that your needs are one of a kind. If you need a specialty chain, we can make it. Manufacturing chain goes right back to our foundations. Whether you need a 3 mm chain, right through to a 24 mm, we can make chain to meet your specifications. Need a lifting sling? We’ll custom make it for you. Grade 100 from 8 mm to 22 mm. Regardless of your industry sector – lifting, construction, infrastructure, manufacturing, mining, food & beverage, marine, transport, agriculture, entertainment, to name but a few ― we thrive on manufacturing chains, lifting slings, and associated lifting solutions for large and complex challenges. You’ll benefit from our commitment to deliver engineering excellence, value and professional integrity. Herc Alloy 800™: a premium grade high-tensile alloy lifting product. PWB® Gr10: the next generation of high grade premium lifting product. Grade P: from higher tensile steel (hardened and tempered), with twice the lifting capacity of Grade L.
Grade L: the highest quality lower tensile steel chain used for lifting and the preferred chain for marine applications. KITO PWB calibrated chain is fitted to devices such as hoists and chain blocks. It also includes calibrated hand chain used to operate manual lifting applications such as chain blocks, geared trolleys and roller doors. KITO PWB proof coil chain is made in a variety of link sizes, and in two link formations – regular and long. Proof coil chain is used in a wide range of industrial and agricultural non-lifting purposes such as fences, barriers and roof supports. We are confident and proud of the quality of products and custom solutions that we deliver. You have our commitment to support the products we deliver. Our suppliers and sub-contractors have been selectively chosen by us for their shared dedication to delivering quality, with integrity. These strong partnerships mean that we constantly exchange information about product quality and workmanship. In partnership with our suppliers, we back our products and will replace or repair products and materials where there is any evidence of faulty workmanship during the normal working life of the product. Naturally, this is conditional on the proper and appropriate use, care and maintenance of the product you have procured from us. We support our products with technical advice, sourcing of spare parts and training, where required. Visit our Services page for more information, or contact us to discuss your lifting requirements. 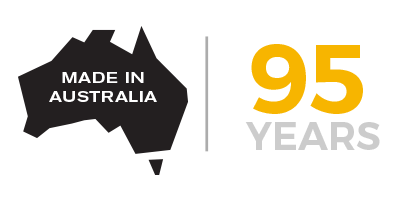 We’re proud to share a long history in local manufacturing, bringing superior quality lifting chains, hoists and associated lifting equipment to Australian industry and beyond.